... ziemlich lieb- und einfallslos ! This album really surprised me after the unlistenable "The Road to Hell: Part 2." Like "...Part 2" was supposed to be a sequel to the original "The Road to Hell," "King of the Beach" is a sequel to "On the Beach." Has Chris Rea come up with an album that lives up to its promise - to be as good as its prequel? This time, the answer is: definitely yes!<br><br>Yes, the album still features programmed drums like "The Blue Cafe" and "TRtH: Part 2" but they are much less annoying. The mid-tempo 'All Summer Long' (an entirely different song to the 'All Summer Long' featured on "Shamrock Diaries") with its killer hook and ticking drum machines was destined to be a summer hit (what it sadly hasn't become). 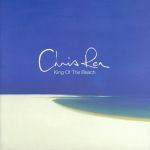 The other mid-tempo tracks, 'King of the Beach' and 'The Memory...' are slightly influenced by reggae. And the rest is ballads. This is probably what Chris Rea does the best. The drum machines are kept more in the background to make more space for some breezy, refreshing synths and Rea's guitar and voice. The highlights are 'The Bones of Angels,' 'Guitar Street,' and the second single: 'Who Do You Love. '<br>Definitely recommended to anyone who's looking for some refreshing music during a hot summer. Wieso lieb- und einfalllos?<br>3.8* aufgerundet. Die CD passt zum Chill/Schläfchen in der Hängematte am Strand.<br>#32 sogar in Polen. Baut zum Schluss ab, hat aber einige gewohnt starke Titel.